‘Schnauzer’ was the name of the first prize winning Wired-haired pinscher (the breed's previous title) which was exhibited for the first time in 1879 in Hanover. Because of its desire to work with the shepherds and guard the family home, the travelling merchants of the 15th and 16th centuries used the Schnauzer to guard their wagons as they travelled from village to village. • The Giant - up to 12+ years. There are three breeds of Schnauzer. The original is commonly known as the Standard Schnauzer. 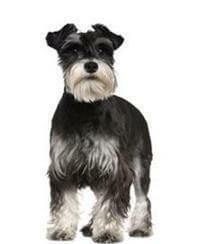 It is the middle-sized Schnauzer and stands between 43 and 49 cms at the shoulders. The females being on the lower end of the scale and the dogs being on the upper end. This breed comes in two colours - pepper/salt (grey) and black. The pepper/salt being the most common colour. The largest of the three breeds is the Giant Schnauzer. This dog was developed for guarding and is used overseas in police work. The Giant Schnauzer stands between 63 and 71 cms at the shoulder and is mainly black. Possibly the most popular of the three Schnauzer breeds is the Miniature Schnauzer. This is a very spunky little dog that intensely dislikes being treated like the toy breeds. They are not a toy, and are often referred to as being the big dog in a small dog body. This breed was originally developed as a vermin hunter and efficiently carried out its duties. The Miniature Schnauzer also makes an excellent guard dog so don't be put off by its size. The Miniature Schnauzer stands between 31 and 36 cms at the shoulder. They come in three colours - pepper/salt; black and silver; and black. Pepper/salt being the most common colour. 1. LOYAL & DEVOTED - the Schnauzer is a one person dog but they love their family. They are tolerant of children and enjoy joining in their games. 2. SLOW TO ANGER - the Schnauzer is not, by nature, an aggressive dog. 3. QUICK TO DEFEND - when mature, the Schnauzer develops a territorial instinct. This makes them an ideal guard dog. They defend their property VOCALLY and not with their teeth. 4. WARY OF STRANGERS - the Schnauzer is stand-offish and aloof, offering devotion to its own people only. It is better to allow the Schnauzer to approach the visitor than the visitor approach the Schnauzer. The Schnauzer is a groomed breed, that is, to maintain its smart appearance they regularly need to be stripped or clipped and trimmed. They are a double coated dog, meaning that they have a soft undercoat and a harsh wiry outer coat. This helps to keep them dry and clean. The Show Schnauzer - the grooming of a show dog is constant and time consuming. To maintain the harshness of coat the dog is stripped out; that is, the dead coat is removed from the body, at least twice a year, to allow a new coat to grow for presentation in the show ring. As the Schnauzer does not ‘drop’ coat, they quickly lose their smartness and shape as the dead coat ‘blows’, that is, it becomes brown and lifeless and lifts off the body. They require regular brushing and combing to keep the coat clean and unmatted. Trimming the face takes time to learn and become proficient at. The Pet Schnauzer - also needs regular brushing and combing so that the furnishings and beard do not matt. However, most breeders recommend that the pet Schnauzer is clipped and trimmed at least four times a year to maintain their smart unique appearance. Most breeders will either assist you to groom your pet or give you the name of someone who is proficient at grooming and lives in your area. The face of the Schnauzer is a unique feature of the breed. The Schnauzer is a very trainable dog. Because they are a very intelligent dog, they enjoy the challenge of trailing. However, unlike most other breeds, the Schnauzer will only do the exercise for a short period of time and then needs to move on to the next activity. If you plan to work your Schnauzer through obedience be prepared to change the activities around frequently so they do not get bored. A bored Schnauzer makes a difficult work mate.